My old bandsaw has broken, nothing too serious, but the casting around the guides broke and being a friction based guide system I just thought enough is enough. In addition it was a tad underpowered when cutting hardwoods of any size. So the time has come to purchase a new bandsaw. 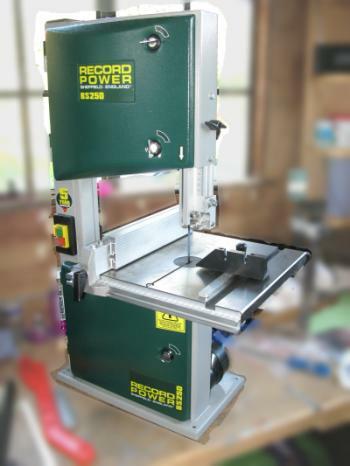 Have been looking for weeks at the Axminster AWHBS250N – good reviews but then I saw the Record equivalent and after some phoning around realised that there was a wood working supplier just down the road who had on in stock. Some of the photos show a very dusty bandsaw – that′s because I just had to assemble it and do trial cuts before taking any images for this article. The bandsaw is packed into a cardboard box and only needs the cast iron table to be fitted along with the tilt mechanism to be complete. In the box is a DVD “Bandsaw Master Class” by Alan Holtham – I was advised in the shop that it is worth watching and totally agree. The DVD goes through the basic features, adjustments and settings, maintenance and making cuts. 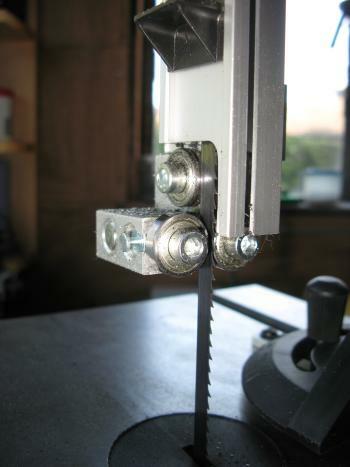 So having watched the DVD I set up the bandsaw taking care to align the table square with the blade. 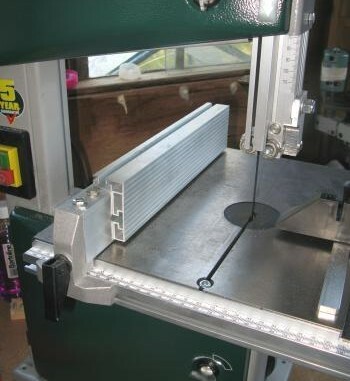 The blade tension is set using the handwheel on the top of the saw, the handwheel is removable. 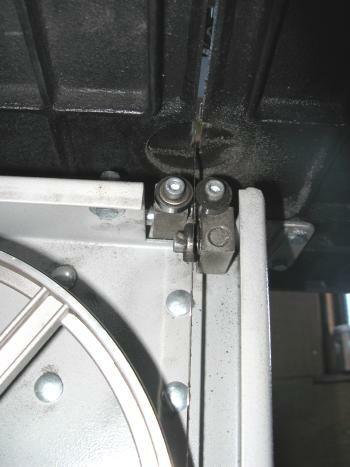 In addition the top wheel can be tilted so as to get the blade running central. Th e top guide has three ball bearings that can be adjusted once you loosen the bolts. Very easy to adjust and get the guides just kissing the blade. The guide moves up and down very easily with a handwheel on the outside once you release the locking mechanish which is a seperate plastic wheel on the front. The guide is made from extruded aluminium and very stiff, cannot see any issues arrising here. The lower guides are again three ball bearings that can be moved once you release the caphead bolts, a bit more fiddly as there is not so much room, but nicely made and again strong. In this image you can see the underside of the table, cast iron and very heavy. There are slots in the fixings that will allow you to square the table up to the blade. The table tilt system is well built and came greased. The table tilts up to 45°. 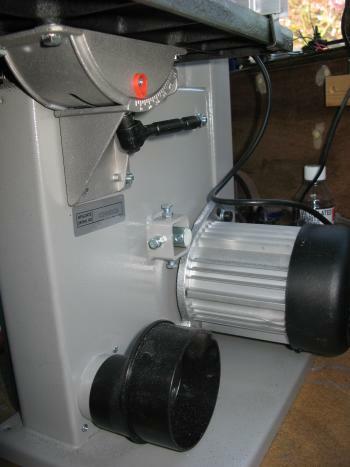 The motor is very quiet and when running the saw overall is very subdued. The extract is set in the lower front portion of the case. The saw comes with an adapter so will work with 58mm or 100mm extraction systems. The fence is perhaps not as nicely made as I would expect as it is a mixture of castings and extrusions. There were countersunk bolts fixing the main extruded tube to the cast square end fixing and must admit that I replaced these with two hexagonal head bolts and washers. It does feel better, but does limit the movement of the adjustable fence. Having said all of that after some adjustment the fence does do the job. Price: approx £200.00 from Alscot Timber Woodworking Supplies Ltd. This is a great bandsaw that is more than capable of doing all that I will ask of it. 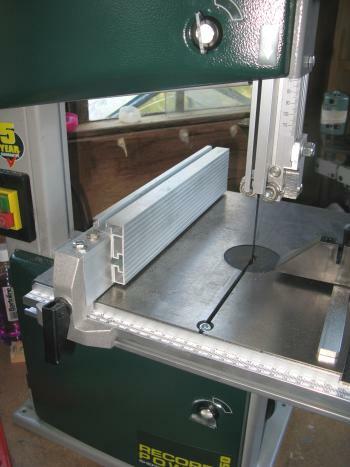 It is extremely well made and the overall frame is very stiff – the most important thing to look for with any bandsaw. The initial cuts I made to set the bandsaw up showed me that I could easily use it to slice large pieces of hardwood and have no issues with blade alignment or power. My workshop is quite small and the overall size and weight of this means that I can store it under the bench. For the model maker this is a far better bandsaw than the Proxxon MB-240 that I tested last year. I would give the Record BS250 4 stars – sorry lost one star as the fence is not as good as it could be. Also, highly recommend: Alscot Timber Woodworking Supplies Ltd. 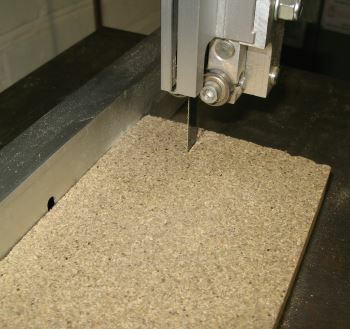 Using the bandsaw to cut a vermiculite brick – the bricks are very soft and I used a fine cutting blade, should probably have been better with a coarser blade that would clear the material away as I made the cut. Either way the result was superb and I ended up with a great looking Brazing Hearth. The guide bearings on this bandsaw last around 12 months before getting full of dust, especially the lower ones. 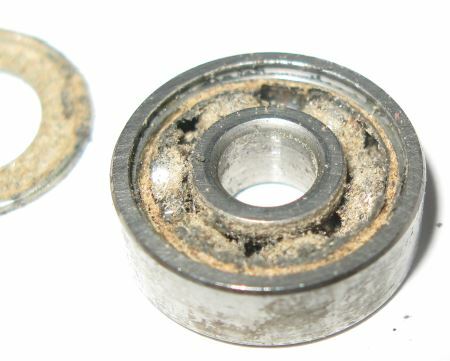 These bearings are a standard size 19 x 6 x 6 mm and so very cheap to replace.